Cape Town - Belgium boss Roberto Martinez has confirmed that Marouane Fellaini damaged knee ligaments against Bosnia-Herzegovina on Saturday. The Manchester United midfielder was forced off in the 29 minute of his country's 4-3 win in Sarajevo, after colliding with an opponent. Initial tests only revealed a sprain, but Martinez conceded the injury is far worse than that, with Fellaini expected to be sidelined for far longer than the two weeks predicted by the Belgians. The 29-year-old has returned to Manchester for treatment and is anxiously waiting on news from the club's medical staff on when he will be able to return to action. 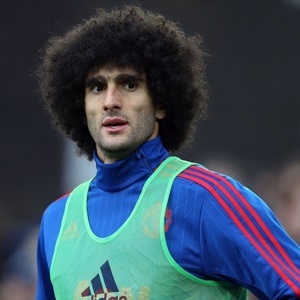 "Marouane Fellaini, it has been confirmed that he has got ligament damage," Martinez told the press on Monday. "He has gone back to Manchester United. Asked how long Fellaini would be ruled out for, the Spaniard said: "Marouane is a very quick healer but obviously now we had the scan and it is damage in the ligament. "Damage could be very little or very big. I think the next few days, we will have a clear idea of the final state of the injury. The first 48 hours, you have still got the swelling. "We don't know at this stage (how long Fellaini will be out for). I think with Marouane, sometimes you expect him to be out, but he is a really quick healer." Sky Sport News confirmed that Fellaini suffered a medial ligament strain and is set to be out of action for two weeks.